I've never ran a marathon. And, to be honest, I'm a little nervous to try. What I'm getting at is: You might beat me. And if you do, you'll make some money doing it! "It was a little army and a little battle, but it was of mighty portent." 273 men died... and hundreds more were wounded on top of Kings Mountain on October 6, 1780. "This is a place of inspiring memories. Here less than a thousand men, inspired by the urge of freedom, defeated a superior force entrenched in this strategic position." -- President Herbert Hoover, October 7, 1930, atop Kings Mountain. When the smoke cleared on the mountain's steep western ridge, the Patriot militia stood victorious. Meanwhile, the red coats had turned tail. President Teddy Roosevelt once called this small but strategic victory the "turning point of the American Revolution." And to this day, the battle's spirit lives on in the inhabitants of York County, South Carolina. Folks here carry a certain dignity because of their home's unique place in history. And why shouldn't they? It's beautiful and rugged land they live on. Which is why it won't surprise you to hear that in 2010, exactly 230 years after the famous triumph, a small band of runners came directly to Kings Mountain for their own "battle." A freak snowstorm in Myrtle Beach and a last-minute race cancellation there had left them with little choice. So they got in touch with Jefferson Nicholson, Co-Founder of Adventure Geek Productions, and inside an hour, the battle was on! Only this time the enemy wasn't a red-coated army. It was the terrain itself. Specifically, 26.2 miles of it. They called the challenge Kings Mountain Marathon. Hello, I'm Jared Campbell. I've been a distance runner for 13 years, and I get really fired up about racing. At the same time, I appreciate the profound joy that comes from just running and finishing a marathon. But like I mentioned, I've yet to experience it. Still, I have a notion the time, sweat, and (let's be honest) money that go into marathon running are well worth it from start line to finish. I bet you agree. Particularly when the race volunteers, fans, and of course, your fellow finishers are special people... and the race course is unique and, well... picturesque. I hope we can share that good feeling come Saturday, April 21, 2012. That's why I want to get you all the important details about the 3rd annual Kings Mountain Marathon in this message today while race entries are still available. And let you in on a special challenge I'm personally issuing that puts cold hard cash on the line. A definite must-do for anyone wanting to experience first-class planning and execution of a nice, small marathon. What a wonderful small marathon. Jefferson and Kristen knew everyone by name and they worked hard to make sure it was a good experience. I will gladly sign up for more of their races because they really know how to put the runners first. "This race director got it right!" The course was extremely well marked. Course support was one of the better ones I've encountered as well as plentiful aid stations! Finisher crowns made especially for two runners who completed their 50 State quest at this event were bestowed upon them by a thoughtful race director. Nice mason jar mugs with the race name were presented to all finishers, and polo shirts were mailed to us after the race. Congratulations to Jefferson and Kristen for a fun-filled event where we all felt like family. The course ran through beautiful countryside with fields, streams, woods, a few houses, and then through the National Battlefield. Very pretty and frequently changing scenery. Hats off to Kristen & Jefferson for organizing a unique and challenging marathon and half marathon in my birth state of SC!! I really love the shirts, the award glasses, and the scenery ... nice to see blooms after a tough New England winter!! Such a great couple of race directors who just couldn't be more southern and sweet ... they gave us oodles of amenities we didn't expect much... There were good course markings and port-a-potties, and the fluid stations were stocked with bananas, oranges, trail bars, cookies and Gatorade, given by smiling, young and good-looking runners. At the end there were practically awards for everyone and a gift in lieu of a medal -- a mason jar with gold-painted kings and queens ...T-shirts came later and were worth waiting for, as they were customized and embroidered. Most unusual course and we all loved the farming country, lakes, and sights, and we had a delightful time that of all of my 60-plus marathons will be highly remembered. And yes, this course satisfies the Marathon Maniacs 50 states challenge, and come race day, it should be a USATF certified course. If so, you have a chance to run for FREE and earn a little bit of pocket cash, too. Now to be fair, while I've never ran a marathon, I'm no hack. Just a year ago, I finished a flat, 21-mile run in 2 hours and 18 minutes. That's my record long run to date. Of course, I've also done a handful of half-marathons and countless 5ks and 10ks with a little success. Still, I think many runners stand a good chance to drop the hammer on me and lighten my pockets. Perhaps the better question is: Can you finish in the top 20? Here's the deal: Every racer who beats me, up to 20th place, gets a full refund on their entry fee. That's courtesy of Race Directors Jefferson and Kristen, founders of Adventure Geek Productions. In addition to a full refund, I'm going to personally hand $100 cash to the first racer to beat me... $50 to the second-place finisher... and $26 to any other top-20 finisher who places ahead of me. Keep this in mind: Last year's 20th place finisher -- Travis Wright from Rock Hill, South Carolina -- ran 4:37. And the winner was Mike Craig of Shelby, South Carolina, with a record time of 3:36! So now that you have all the information, I hope you'll be among those to answer my challenge. Now let's talk about the cost to run this marathon. Honestly, I was a little astonished when I heard it. Most marathons run north of $100. Jefferson and Kristen, the "Adventure Geeks" I've mentioned, are only asking $80 for a day of scenic running and spirited fun. And remember, if you beat me to a top-20 spot, the cost for you is nada. You'll get a full refund (and more!) with my compliments! I can't wait to meet you at the start line for our friendly, "high-stakes" competition on Saturday, April 21, 2012! P.S. 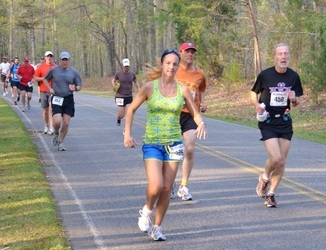 Jefferson and Kristen, the original "Adventure Geeks," also put together a great $40 deal to run the Kings Mountain Half Marathon, scheduled to start alongside the full marathon on Saturday, April 21. Click here to register! P.P.S. Co-Race Director and Adventure Geek Co-Founder Kristen Thomas is happy to answer any specific questions you have about Kings Mountain Marathon. And she can send you a fact sheet with answers to common questions like, "What hotels are offering special race discounts?" Simply contact Kristen here. P.P.P.S. Get this: Jefferson just reminded me he has guaranteed a 50% refund for any cancellations up to March 21. As you know, that's about the most generous policy around. Now, I don't know how fast the race entries will go, but if you're like me, you like to book a race early so you can commit to the necessary training. 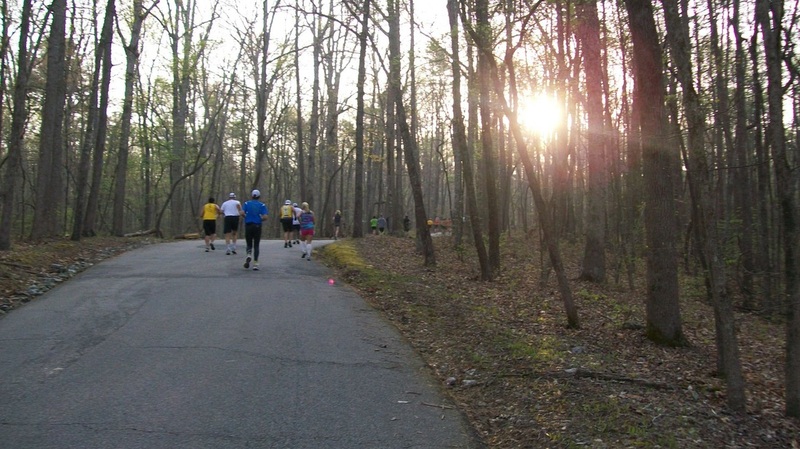 Don't wait -- register for the Kings Mountain Marathon today!